Science Museum Solar System Mobile Making Kit - spacekids - space toys, dressing up costumes, kids spacesuits, astronaut food, cool space stuff! 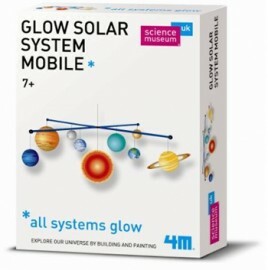 The Glow Solar System Mobile enables you to learn about the Solar System whilst making a useful model. You can apply the glow paint and hang from your ceiling to see the planets glow. Reflecting the true layout of the Solar System the mobile will help you recognise the planets and remember their names. A wall chart is enclosed.